For the third straight year, the UA expanded strategic international relationships at Global Partner Day, hosted by the Office of Global Initiatives in partnership with the Office of International Education. Representatives from universities spanning from Australia to Brazil connected with UA faculty and staff in Tucson during a series of networking events, interactive lectures, and campus tours— creating new pathways to collaboration. Starting with a welcome reception at Flandrau Science Center and Planetarium, longstanding partners learned about the latest UA initiatives, while new partners discussed research and student mobility programs designed to advance education that transcends countries. Thirteen partners from nine countries agreed that the UA’s first-class research platform, innovative programs, and renowned campus provide great opportunities for the strongest students from their institutions. UA students also stand to gain advanced intercultural competency skills by connecting with international peers, providing a solid footing for today’s global marketplace. 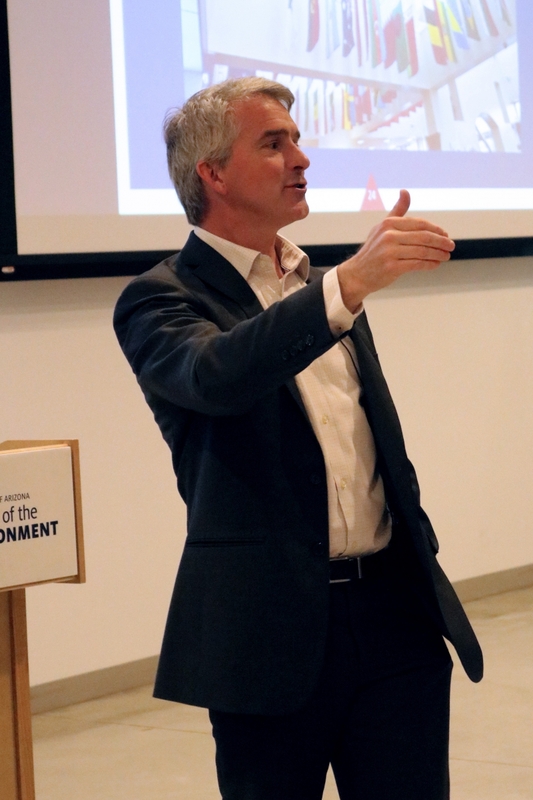 Building on the idea of preparing students to thrive in an increasingly international workforce, Remy Arteaga, director of the UA’s McGuire Center for Entrepreneurship, provided the keynote address for Global Partner Day at the Environment and Natural Resources 2 Building. Discussing global entrepreneurship education, Arteaga highlighted potential growth areas around the world for start-ups, but also cautioned that development must be approached mindfully. “Entrepreneurship is all over the world, and we want students to understand the opportunities, but they must also recognize cultural differences,” he said. The Office of International Education hopes to bridge cultural gaps with the Global Micro-Campus Network, an initiative they revealed to the university community during Global Partner Day. Micro-campuses are UA spaces at partner universities that enable the delivery of collaborative UA degree programs to local students, addressing global demand for higher education. Administrators from the American University of Phnom Penh attended Global Partner Day to discuss the current micro-campus at their institution in Cambodia. Gary Rhoades, director of the UA’s Center for the Study of Higher Education and Brent White, vice provost of international education at the UA, unveiled research behind the micro-campus model and plans for its expansion. With agreements already in place for micro-campuses at 13 partner universities, the UA is on track to reach its target of 25 or more micro-campuses in three years, capable of educating more than 25,000 global students abroad, while also providing mobility and research opportunities for UA students and faculty. Ash Scheder Black with the UA Office of Global Initiatives also shared his model for developing the next generation of culturally competent individuals through the program Tech.Global, of which he serves as executive director. The 100% Engagement experience allows students to embrace tech challenges as they work with various coding languages to master application design and cybersecurity principles— and even create virtual reality environments. Participating students have a strong desire to explore the world through technology, and Black inspired international partners to consider hosting similar programs in order to foster a global network of collaboration. Following presentations at ENR2, international partners got a better feel for the UA with a tour of campus, including the Richard F. Caris Mirror Laboratory where scientists and engineers make giant, lightweight mirrors of unprecedented power for a new generation of optical telescopes. Brazilian partners also visited the UA, affirming their decades-long commitment to the university. The director of United Kingdom-based Kaya Responsible Travel, a volunteer and internship placement organization, said she was excited to learn about experiential learning options through UA Study Abroad. The model provides opportunities to apply classroom learning to real-world challenges abroad through service learning, internships, research, field work, and clinical shadowing. While new partners navigated ways to collaborate with the UA, established partners discussed ways to advance their relationships, creating avenues to connect the strongest students and scholars from around the world. Members from the National Autonomous University of Mexico (UNAM), the largest university system in Latin America of which the UA houses a satellite office, said they were looking forward to working together for years to come. For an inside look at 2017 Global Partner Day, view these videos (Office of Global Initiatives).